Hinx’s final scene in the film is an intense fight on a train travelling through Morocco, and for this scene he wears a three-piece suit that Everest says is made of beige Capri wool. I could not find much information on what capri wool is, but Versace sells clothes made from a blend of wool, cotton and polyester in an open weave that they call “Capri wool”. Though I can’t imagine a great tailor such as Timothy Everest would care to work with a cloth blended with polyester, polyester’s wrinkle resistance looks great on camera. Hinx’s suit looks very crisp for a lightweight suit, so perhaps it does have a small amount of polyester. And though Everest calls the suit beige, it’s darker and richer, more of a light brown. The light brown colour helps Bautista’s dark, warm complexion shine whilst also fitting in with sandy Morocco. Bautista is a huge, muscular man, and this type of body is very difficult to fit. Since he is always in motion, the fit of his suit cannot be judged from what we see in the film. The button two jacket is tailored in an English fashion with straight shoulders and roped sleeve heads. Padding in the shoulders of Hinx’s suit jacket is used to straighten the shoulders rather than to build them up. The padding helps the cloth to drape over his shoulders neatly and elegantly. The jacket is detailed with double vents, slanted flap pockets and four buttons on each cuff. 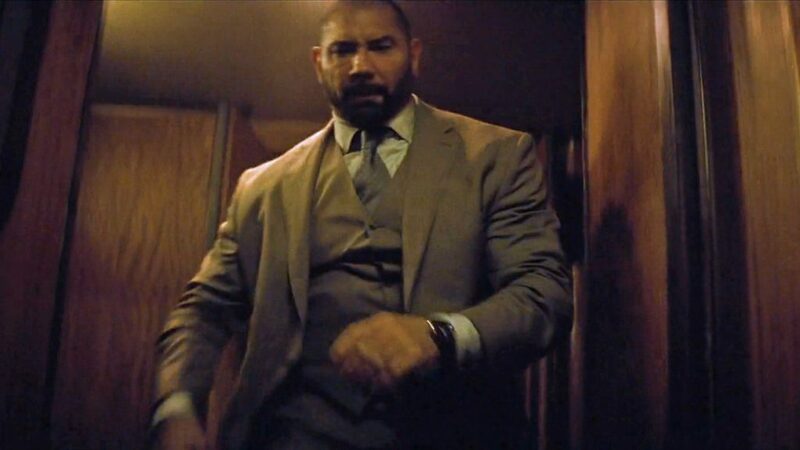 The suit’s waistcoat has six buttons with five to button, spaced apart to cover Bautista’s large frame. The waistcoat does not lay cleanly on Bautista’s large body, which may have been intentional, however, waistcoats are the most difficult garment to cut as they are required to fit the body more closely than any other garment. 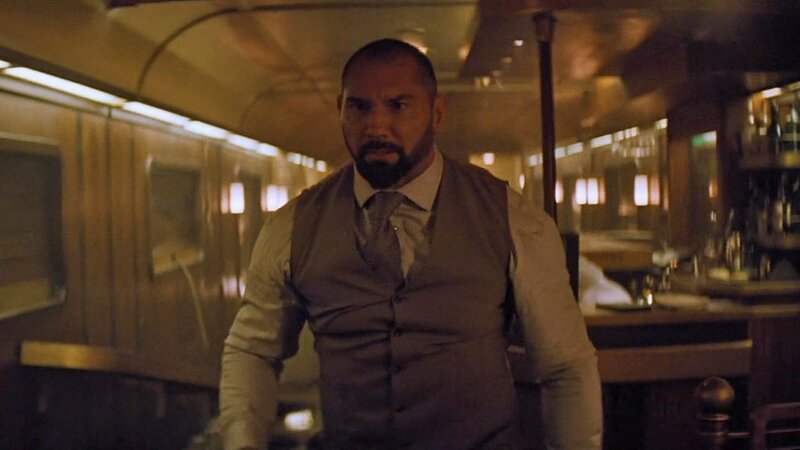 Though the armholes of the waistcoat are cut in an ordinary manner, they accentuate Bautista’s broad and muscular shoulders that burst out of the armholes when we see him without the jacket. Removing the singed jacket removes the sophisticated menace from Hinx’s appearance and replaces it one of pure menace. Without the jacket on, the shiny copper satin back of the waistcoat is revealed, flashiness that identifies him as a villain. The jacket is also lined in the same copper satin material. Hinx’s suit trousers are cut with a flat front and tapered legs that have plain bottoms. The trousers have slide-buckle side-adjusters, slanted side pockets, one rear button-through pocket on the right. Hinx’s shirt is a microcheck, probably in grey and white. It has a wide but short spread collar and rounded single-button cuffs. The shirt’s buttons contrast the shirt in brown. Hinx’s tie is grey with black lines and white dashed lines horizontally across it. He ties it in a four-in-hand knot. Hinx’s socks are light brown and his shoes are chestnut brown that fasten with monk straps and have Dainite studded rubber soles. The shoes have a sleek, modern English last with a chiselled toe that make Bautista’s large UK size 12 feet look elegant. 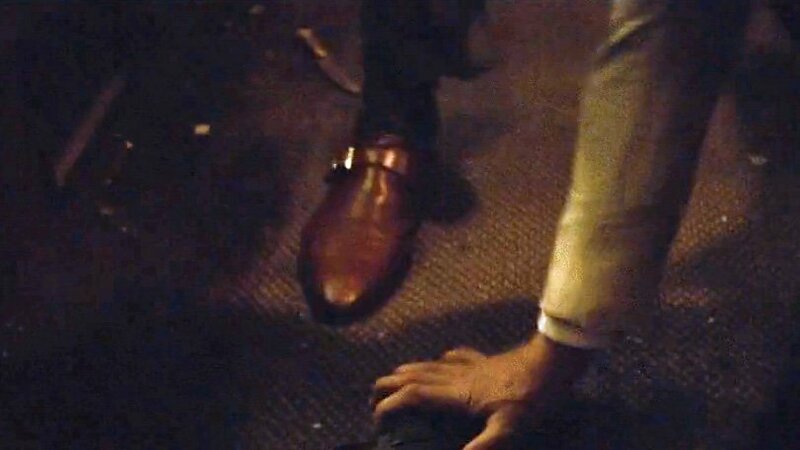 Though Crockett & Jones only takes credit for supplying Daniel Craig’s shoes for Spectre, these shoes resemble their Monkton model. The Monkton does not come with Dainite soles, but it’s entirely possible that Crockett & Jones made the shoes especially for Bautista with Dainite soles. Sorry, but to me Mr Hinx is really nothing but a (forgettable) henchman. “The elegant wardrobe, the very manicured look” doesn’ t help preventing that impression. 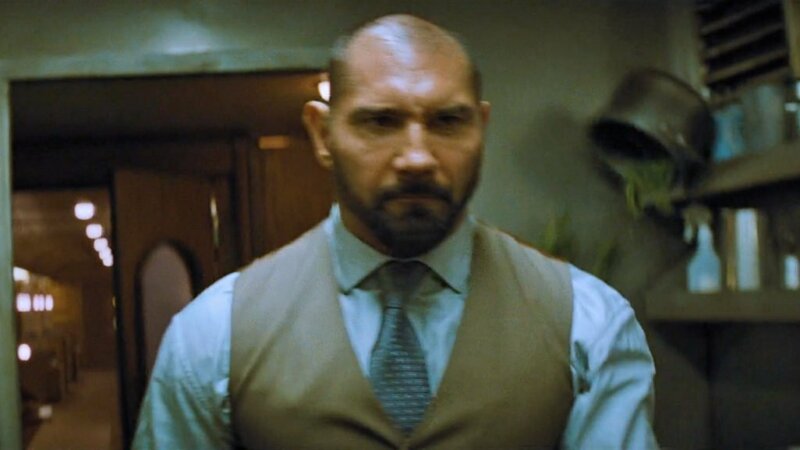 And furthermore Bautista is no “suit type” – i.e. the suit does not really improve the “muscle-head” image he creates automatically by his outer appearance. 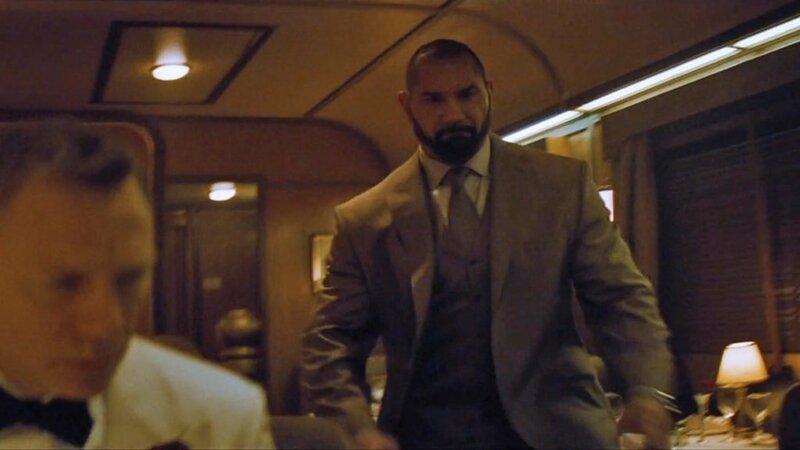 Allowedly Bautista has a lot of presence in the train scene but this is due to his physical impact and not to his suit. And for sure the word “sophistication” does not apply to him (his character is not supposed to be sophisticated – quite the contrary). He is nothing but an ordinary thug – period. As to the suit itself: IMO it is neither outstandig nor – as one can judge from the stills – very well done. Looks rather like off-the-peg than bespoke. I like this outfit very much and that they clothed him in this type of style. His physique is crazy and it speaks for the character in my opinion that he wears such a great suit. Nice post, Matt! Great article! There are certainly some henchmen in the series who dress well, even if they are few. 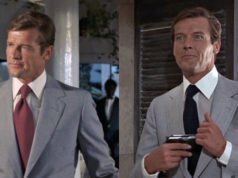 I’m curious if you’d write about Tee-hee’s houndstooth suit from the end of Live and let die and Sandor’s charcoal suit from the rooftop scene in The spy who loved me. Sandor certainly dresses better than his boss and Tee-hee’s suit is quite nice too, especially compared to the rest of his clothes in the film). Given Mr. Bautista’s extraordinary physique, I think the suit looks fantastic. He has such a great screen presence. He had the makings of a great and memorable henchmen. It’s such a pity that his character was so underdeveloped and under utilized in the film. His death scene was especially weak. I’d like to think that maybe that wasn’t his death and that he might return like Jaws in the next film if they continue this Bond/Blofeld story line. Yes, I think they ruined a good thing very quickly with Hinx. Huge promise, for the entire film, actually. Having said that, I do like the cut of this suit. But I am English after all. I agree. Why set up such a revolting character trait as having the sheer iron will to be able to slowest poke a man’s eyes out with thumb daggers in an impressive entrance scene, only then for him to be nothing but a big hulk for the rest of the film? Surely he could have at least made a play for poking Bond’s eyes out in the final fight? He has a good look, his smile is perfectly evil, and I wouldn’t have been surprised to see him return with a smashed up face from his train exit had Blofeld not already sported one himself. Just a bit of a badly written role. A hint of a back story would be nice. Why didn’t anyone else on the train appear or even scream as the fight moved along the carriages – everyone vanishes. Had they used the funding for extras up in Mexico? 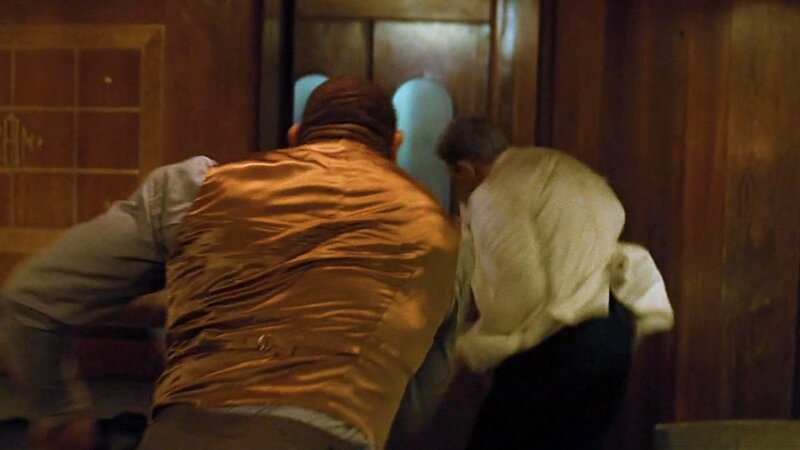 No one pulls the emergency cord even after gunshots are fired…the sudden jolt could have worked in Bond’s favour. I love the tone of the film, the casting is great, the suits are an improvement but the script is just as lacklustre as the last one! In my opinion Hinx is one of the best henchmen in years simply because he is such a classic Bond henchman. He is litterally larger than life and such a character does not have to be written with a very developed character or realistic backstory in order to be effective in this type of film. 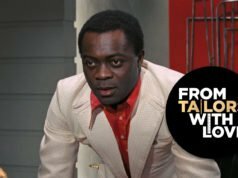 Very few of the Bond henchmen in this tradition are well developed characters – Jaws in TSWLM, Oddjob, Hans, Sandor, Gobinda etc. In my opinion, the few times in the series that they have tried to give a strong-man henchman more depth it has come off as forced and silly, like with Eric Kriegler or Stamper, not to mention Jaws and his love affair in Moonraker. Ok, a complete back story isn’t necessary but it’s not even mentioned why Hinx is trying to kill Bond. Blofeld clearly wants and expects Bond to arrive at his secret base (how if its location is secret?) as he sends a car out for him and so, to make sure he gets there safely so he can torture him, he sends Hinx after to him to kill him before he can arrive. What? Not brilliant writing. Better writers – and it should be said – directors, editors and even producers – would have spotted these issues. I like it when Bond is a bit more fantastic but it has to have its own internal logic and these last two films have had more plot holes than a bullet-ridden colander. Which is a shame as the rest of the film is great, it’s just the story that’s a bit amateurish! As my school reports often said – “C+, must try harder”. I think my big issue here, is that if you were to watch this film immediately after Casino Royale, you’d wonder what the hell happened to the idea of the “reboot”. From Casino Royale, the films have gone downhill in order, IMO. TBH it’s almost exclusively down to writing and directing. But that’s more than half of a motion picture, right there. Martin, in my opinion the Casino Royale “reboot” is something the latter films has tried to distance themselfes from but have unfortunately failed. I wonder if we will see any “classic” Bond films until Craig leaves the role. SPECTRE may be the closest it can get with the current formula. Considering Dave is such a big muscular guy, they did a great job of tailoring for him, softing his build and making him look somewhat elegant; considering his hulking appearance. Given the shortness of Hinx’s neck, a slim tie with a small knot would look better. Do you have any idea who the makers of Mr. Hinx’s shirt and tie are? I now have this wonderful image of Oberhauser sending Hinx to his tailor in order to get him looking the part of a Spectre assassin. Poor old M, his tailor knows more about this shadowy organisation he’s tracking than he does! I think I can help you with regards to what Capri is. The cloth house Scabal has a range of lightweight wools called “Capri”. This would be a sensible lightweight cloth to make a suit up for a man like that as it is not only on the lighter side but it has quite a bit of natural stretch. Thank you, David. That’s very helpful. I don’t approve of polyester. 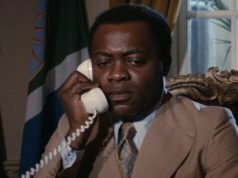 Bond wears a brown suit in M’s office in Thunderball, doesn’t he? I thought the rule was “No Brown in Town.” But I believe Nicholas Storey in History of Men’s Fashion stated that rule applied to the one square mile known as the City. Is Whitehall in the City? I think l can help with the ” Capri wool ” part. In Thailand , Tailors offer a material called Capri Wool which is a fabric made from 98 % wool and 2 % Lycra . It was also the material used to make Agent 47’s suits in the Hitman : Agent 47 film. Great for Action films , where they have to move a lot quickly , apparently.